I spent an entire week in the Iguazu Falls area. Bet you’ve never heard anyone say that before. Normally, it’s a brief stop. One day on the Argentina side, one day in Brazil, and you’re on your merry way. But as a working digital nomad, I decided to post up in the area for the week so as not to interrupt my work schedule with a flight and location change. While this may not have been my brightest idea ever, I learned a lot about the falls, the highlights and benefits of seeing them in each country, border crossings, a special nighttime tour, and transportation. Now, I shall pass my findings onto you! Iguazu Falls is one of the New Natural Wonders of the World, and with good reason. 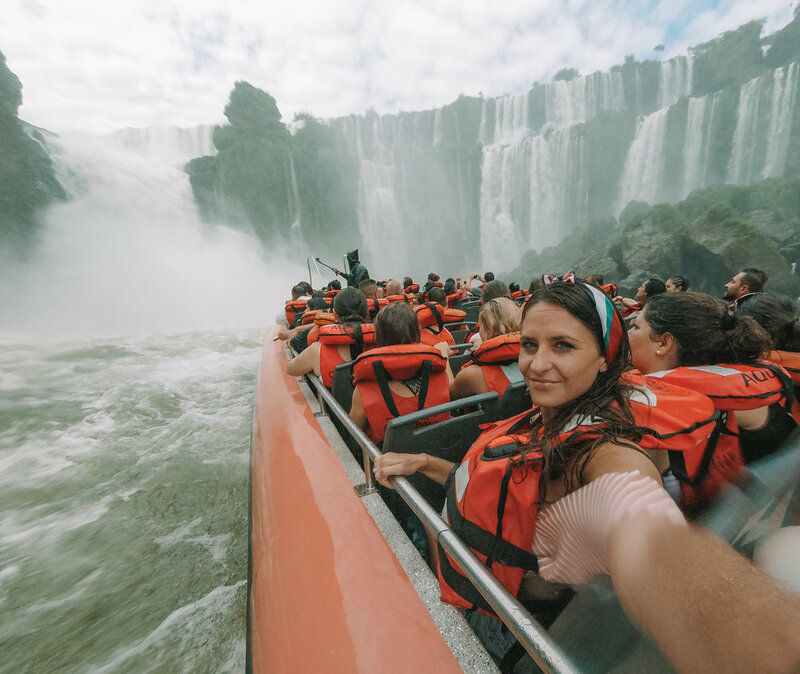 With 275 individual waterfalls that plummet into a giant divide between the Brazilian and Argentinian borders, it’s a massive attraction that needs at least two days to explore thoroughly. Iguazu are the widest falls in the world, and 700 million liters of water come crashing down per second (how anyone measures that is beyond me.) 80% of the falls belong to Argentina, while the other 20% are in Brazil. This has created a bit of a rivalry between the two countries over which side is most worthy of your visit. The truth is, they’re both very different and pretty hard to compare. If you’re going to go, you should make time for both. You could spend an entire day exploring the many trails in Argentina, while the Brazilian side is a single trail with amazing views on your righthand side that can be seen in as little as two hours. 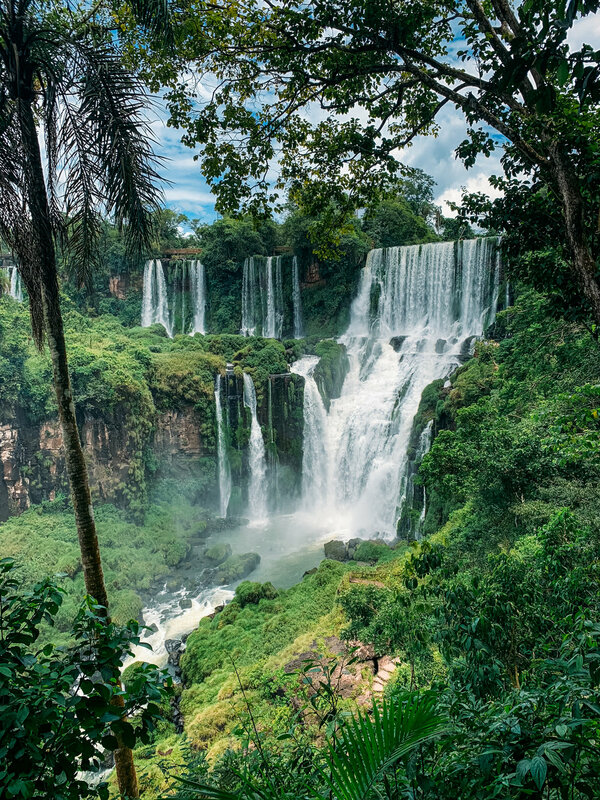 Because 80% of the falls are in Argentina, you get an amazing sweeping panoramic view of them from Brazil, but there’s something pretty magical about wandering through the jungle and seeing them up close and personal on the Argentina side. The Argentina side also puts you right into the Devil’s Throat, and that scene is truly jaw-dropping. In short, try your best to make them both happen! There are two airports that service Iguazu Falls- IGR Cataratas International Airport on the Argentina side, and Aeroporto Internacional de Foz do Iguaçu in Brazil. From there, you can take taxis or shuttles to your accommodation. I flew into Argentina, where taxis charged a flat fee of 700 pesos to Puerto Iguazu, the main city and gateway to the falls. It’s about 20 km away, and takes approximately 25-30 minutes to reach. Something else to note is that Brazil DOES have Uber, while Argentina DOES NOT. It appears that these Ubers do NOT cross the borders between the two countries (I tried) in case you were considering that at any point. I did take a taxi from Puerto Iguazu to Foz do Iguazu, and that was also a flat rate of 700 pesos, even at midnight when I expected to get completely and utterly ripped off. If you’re planning to go between Puerto Iguazu and Foz do Iguaçu by bus, it’s fairly easy and only costs 60 ARS (less than $1.50 USD). Several bus companies make the route, and I personally used Rio Uruguay (red and yellow buses) to go from Argentina to Brazil. Going from Brazil to Argentina however, I hopped on a blue bus that serviced the random bus stop I found along the “international” route. I honestly found things much easier to figure out on the Argentinian side- it took a bit of asking around coupled with excellent mime skills to sort out where I could catch the bus in Brazil to get to Argentina. I could have made it easy on myself by going to the Terminal Station, but I’d heard there was a stop closer to my hotel and jumped through hoops to figure it out. Each time you cross the border, you need to go through immigration, and the bus will take you through the process. You will need to exit the vehicle, get your passport stamped by an officer, and get back on the bus, which will be waiting outside. Opening hours: 08:00 AM – 06:00 PM every day of the year, without exception. To visit the falls from Puerto Iguazu, you can catch a bus from the main Omnibus Terminal (pictured above). Roundtrip tickets cost 320 pesos and can be purchased on the bus or from one of the red Rio Uruguay ticket counters. Make sure you have somewhere to keep that return ticket dry as it will most definitely get wet if you don’t. When you arrive at the park, you can purchase tickets with cash or credit card at the ticket counter. The price of a regular adult ticket is 700 ARS, or approximately $17 USD. Additional information on ticket prices can be found on the park’s official website here. If you want to see the whole park, I would allocate the entire day to the visit. I arrived at 8:20 AM and stayed til about 5:30 PM. During this time I was able to take a boat ride, walk both the inferior and superior circuits, visit the Devil’s Throat, and take some breaks to just sit and relax and eat. Speaking of eating, packing a lunch wouldn’t be the worst idea, however there are places to eat inside of the park, just at slightly inflated prices. I did eat inside the park, where I carried on with my traditional empanada diet, and spent 200 pesos for 3 empanadas and a drink. Individual empanadas were 50 pesos each, whereas out in the real world, 20 pesos is a common price. 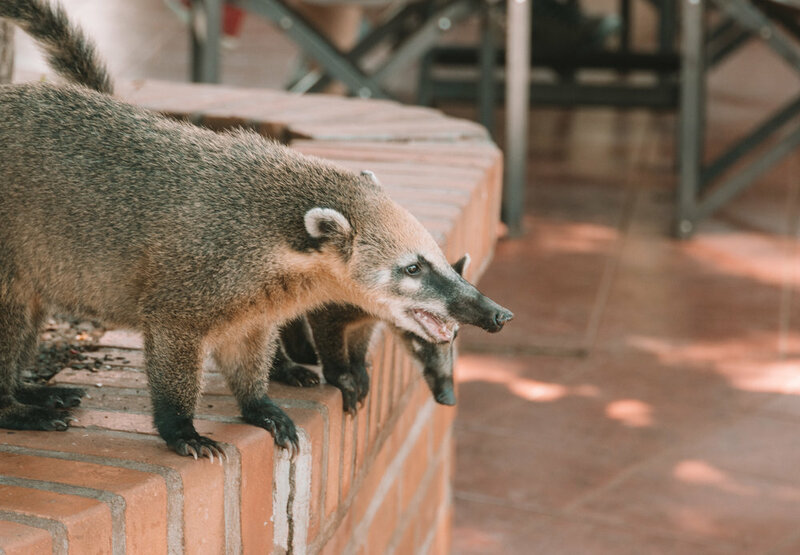 But where there is food, you’re also going to find coatis- a really adorable member of the raccoon family that is also really hungry and nasty when it comes to foraging for a meal. So while they are stinkin’ cute, it’s best to admire them from afar and keep your lunch safely out of reach. They will steal it, possibly bite you, possibly give you rabies, and that just isn’t ideal. Just check out the Jekyll and Hyde situation in the photos below. I also saw quite a few monkeys swinging around, but didn’t witness any attempts at food theft. This activity came highly recommended, so upon entering the park, I bee-lined it for the yellow tour booth just a few meters in on the right hand side. I signed up for a 9:00 AM tour, which cost 2,000 pesos per person (credit cards accepted.) The tour started with a beautiful drive through the jungle in an open top vehicle, during which time we spotted quite a few colorful toucans. When we reached our destination, we exited the vehicle and walked down some stairs through the jungle to the edge of the river, picking up large dry bags along the way. The boat can hold about 40 people and takes you on a scenic ride down the river towards the Devil’s Throat, stopping occasionally to go UNDER several falls. You can’t keep your eyes open and you get absolutely drenched, so I’ve never enjoyed nor understood this particular activity. If you’re wondering about your fancy camera or phone, you CAN bring it, just be sure everything is put back in the dry bag before the boat goes under any waterfalls. When it’s over, you retrace your steps back to the vehicle, through the jungle and back to the starting point in the park. If you look at the map, you can see that they estimate these circuits to take 90 minutes and 120 minutes respectively. I took my sweet time and also took a million and one photographs, so I honestly can’t confirm or deny that these estimates are accurate, though I think that they probably are. The inferior circuit takes you on a trail that winds along the lower part of the falls, while the superior circuit takes you along the upper part of the falls, meaning you’re more looking down at them than into them. In my opinion, the lower circuit is much more enjoyable, but they both offer some stunning scenery. I’ll share a few photos from each to give you an idea of what to expect. The Devil’s Throat is by far the most impressive thing you’re going to see all day- it honestly took my breath away. Take the sheer size of it plus the volume of water flowing plus rainbows and you’re going to be so enamored that you won’t even notice or care that you’re getting soaked to the bone by its spray. I’ll let some photos speak for this one. This itinerary was enough for me for the day, but there are several other trails to explore including the Green Trail, Macuco Trail, and San Martin Island. The free boat that takes you over to San Martin Island was closed when I visited, but I don’t have any details as to why or when it will reopen. If you only have time for one meal in Puerto Iguazu, prioritize this restaurant. It’d been recommended to me by several people, and after one bite of filet mignon, I quickly understood why. If you’re not a meat eater, there are veggie options as well! It’s a little more upscale than the other options in town and can get busy, so consider making a reservation or don’t be too surprised if you have to wait a bit. 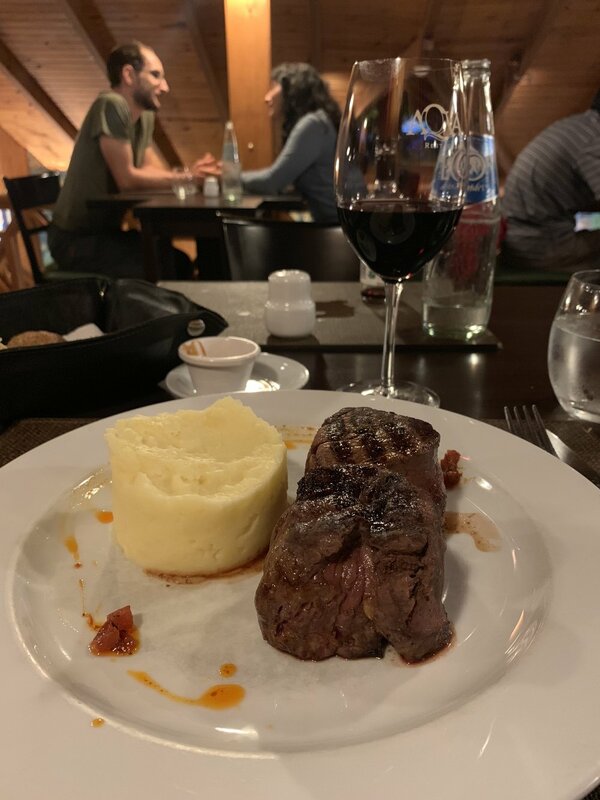 Located near the bus station as well as the above-mentioned Acqa, this Argentinian restaurant has a little something for everyone. For me, a highlight of eating here was watching the tango dancers that go on in the evening. ….and then of course there’s always Subway or empanadas when you’re on the go or aren’t feeling a proper sit-down restaurant. And that’s ok, too. Truth be told, I wasn’t the biggest fan of my accommodation choice in Puerto Iguazu, but that’s also because I had to sit in the room all day and work. If you just need a big, comfortable bed to sleep in at a budget price and with a good location right near the bus terminal, check out the Oxum Hotel. They can be found on Airbnb here. Never used Airbnb before? Get $40 off your first trip by signing up with my invitation here! Opening hours: 09:00 AM – 05:00 PM every day of the year, without exception. The cost of a regular adult ticket is 70 reals, or approximately $18 USD. Additional information on ticket prices can be found on the park’s official website here. Once you’re in Foz do Iguaçu, the fantastic taxi service that is Uber makes life infinitely easier. You don’t even need to have working cell service to take advantage of it, either. If there is Wifi at your hotel/Airbnb/hostel, order up an Uber to the National Park and it will run you about $5. Worried about getting back? Don’t be- there’s Wifi at the National Park that will allow you to book a return ride. There are buses that service the park, but for the price of an Uber I honestly couldn’t be bothered. If you want to go by bus, you’ll want to catch the 120 from inside the Terminal de Transporte Urbano (TTU). It runs every 30 minutes, and the entrance to the falls is the last stop. Visiting the falls on the Brazilian side is pretty straight forward. Once you’ve purchased your ticket, you’ll see everyone lining up to catch a double decker bus. This is how you get to the falls. It makes several stops along the way for people that would like to do boat tours, bicycling and hiking, but if you’re just trying to get to the falls, ride it out until the last stop. You’ll be dropped off at the start of the one and only trail that runs along the Brazilian side, offering incredible views of the falls, all on your right-hand side. There are multiple (crowded) viewpoints along the way where wooden platforms jut out a bit beyond the trail itself. Towards the end, you’ll see the best walkway of all. The path winds out over the water, is surrounded by waterfalls, and ends in a platform where you’ll find stunning panoramic views of the Devil’s Throat and other gorgeous falls on the Argentina side. Again, you’re going to get wet, so be prepared! After you’ve explored the walkway, you’ll come across an elevator that you can take up to another viewing platform. The day I visited, it was nothing but blue skies and rainbows. So beautiful. I love Italian food, and this restaurant came up on TripAdvisor with really good reviews so I decided to give it a try. The restaurant had charming decor, the staff were dressed like actual members of the mafia, and the pasta and wine were delicious. I had to work every day that I spent on the Brazilian side, so I was looking for reliable Wifi, breakfast, and a clean and quiet room. I’ve always been a huge fan of IBIS hotels, so I opted to stay in the IBIS Budget Foz do Iguaçu. I was not disappointed. The room was cute and comfortable, it was super affordable (about $30 USD/night) and they had a big breakfast spread every morning. It’s also located across the street from a big shopping mall which was quite convenient! • 1st shift 7:45 PM. What I can tell you is that for the 8:30 PM tour, I took a 7:30 PM bus and this gave me more than enough time. As for the return bus to Puerto Iguazu, you can see the times listed at the bottom of this sign here. My second shift tour ended with enough time for me to catch the 11:35 PM bus back. Because of poor planning, I was staying on the Brazil side, and had to take a taxi from Puerto Iguazu back to the Ibis in Foz. Luckily, I got the fixed 700 ARS rate, and my taxi driver was a real treat- told me all about how he drove Robert De Niro around recently. The tour itself starts with a moonlit train ride out to the start of the path that leads to the Devil’s Throat. The moonlight is enough to guide you along the path, which illuminates the water from all sides. When you reach the Devil’s Throat, the view is absolutely spectacular. The mist will more than likely get you very wet ( I got soaked) so consider bringing a waterproof jacket. DO NOT use flash photography, as it will only piss off everyone around you and keep your eyes from properly adjusting. If you’re lucky, you’ll see a moonbow (a nighttime rainbow) like I did. If you’re unlucky, your camera will break and you won’t be able to take any photos. That said, there is a professional photographer set up to take your photo for 500 ARS, or about $12. They give you an 8 GB SD with the photos on it on the spot. That is how I was able to get one clear shot of me and the falls, pictured above! That brings me to the end of my Iguazu spiel! Hopefully this information helps make your trip planning easier. Feel free to ask any questions or give input in the comments below. Enjoy one of the most beautiful places you’ll ever see!